We're not talking about sweeping with a broom. We're talking about creating sweep geometries and threads in SOLIDWORKS. These features are some of the most misunderstood in SOLIDWORKS, and we're going to break them down for you in this blog. A frequently asked question amongst clients is, "What is a sweep?" Within SOLIDWORKS, a sweep is a tool that creates a solid, a cut or a surface feature by moving a profile along a path. To create a solid, use the Swept Boss tool to move a profile along a path. The profile can contain one or more closed contours. To create a cut, use the Swept Cut tool to move a profile along a path. To create a swept surface, take a profile and sweep it along a path using the Swept Surface tool. Keep in mind, SOLIDWORKS offers three different types of sweep profiles: sketch, circular and solid. Beginning with SOLIDWORKS 2016, if the profile is circular, the new Circular Profile option only requires a path to be sketched. For more information on profile rules, download our infographic and watch our on-demand webinar. In SOLIDWORKS, a cosmetic thread is no more than a texture map used to represent the look of a thread on a cylindrical shaft or hole. Cosmetic threads don't change the geometry itself and therefore create minimal impact on system performance. Cosmetic threads also allow you to attach thread callouts in drawings. 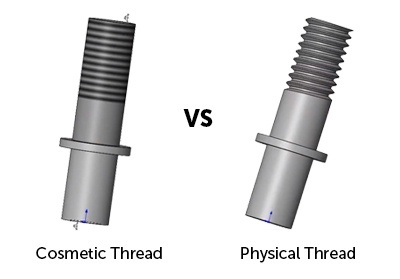 The primary disadvantage of a cosmetic thread is that mass property calculations do not account for missing threads. The main disadvantage for using physical threads is the negative impact on system performance. PRO TIP: Get the best of both worlds. Create a configuration where one configuration shows the part with cosmetic threads and another configuration has the physical threads. Download our sweeps and threads reference guide to maximize your efficiency when using these tools in SOLIDWORKS.